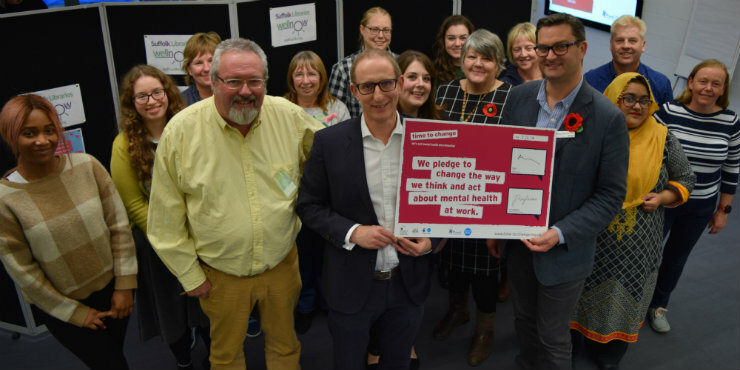 Suffolk Libraries has signed an employer pledge with Time to Change, the growing social movement run by charities Mind and Rethink Mental Illness which supports people to open up about mental health problems. By signing, we are committing to change the way we all think and act about mental health in the workplace. The signing ceremony took place on Wednesday 7 November with Bruce Leeke, Suffolk Libraries chief executive, Jon Neal, chief executive of Suffolk Mind, Tony Brown, Suffolk Libraries chairman and members of library staff from across the county in attendance. The event was organised by a team of Wellbeing Champions from Suffolk Libraries and also involved an opportunity for staff to get advice and try some activities designed to improve their health and wellbeing. Suffolk Libraries chief executive Bruce Leeke said: “Throughout our lives we all face many different challenges. Depending on our personal make-up, these challenges can impact the way that we feel and our mental health. Personally, I truly believe that putting a focus on your own wellbeing is a key step to help get the best out of life and successfully navigate the many bumps in the road. Time to Change is funded by the Department of Health, Comic Relief and the Big Lottery Fund. Set up to create a positive shift in public attitudes towards mental health problems, Time to Change supports communities, schools and workplaces be more open about mental health problems through talking and listening. We have joined a wide movement of over 450 organisations that have signed up to the Time to Change pledge, including E.ON, British Gas, Ernst & Young, Transport for London, Royal Mail, Barclays, Shell, Pepsico, the Church of England, Sunday Mirror , Marks and Spencer, and many NHS trusts, universities, and local authorities.